Robert L. Howell, son of Rebecca Summey Howell, husband of Liddie Abernathy. Liddie Abernathy, daughter of Bardy Larkin Abernathy and Matilda Francis Bradshaw. Funeral services for Mr. Robert L. Howell, 54, well-known farmer residing on Route Number One, Cartersville, who died at his home on Monday following a short illness, were conducted Tuesday afternoon at 2 o’clock from Macedonia church, Rev. Mr. Dempsey officiating. Interment was in the church cemetery, Owen Funeral Home in charge of arrangements. A native of Bartow, Mr. Howell had made his home here practically all his life, carrying on extensive farming interests. He was a member of the Baptist church. Besides his wife, he is survived by three daughters, Mrs. E.R. Abernathy; Mrs. W.P. Abernathy, and Mrs. W.E. Barger, all of Cartersville; one brother, Mr. John Howell of Dalton. Friends extend tenderest sympathy to members of the bereaved family in their hour of great sorrow. Funeral services for Mrs. Liddie Howell, 77, who died at her home in Cartersville Friday after two weeks illness, were held at Macedonia church Saturday afternoon. The Rev. Dempsey, assisted by the Rev. Hembree, had charge of the services with the Owen Funeral Home in charge of arrangements. Mrs. Howell was the former Liddie Abernathy, daughter of the late Matilda Bradshaw Abernathy and the Rev. Bard Abernathy. A native of Bartow county, she was a member of the Baptist church. 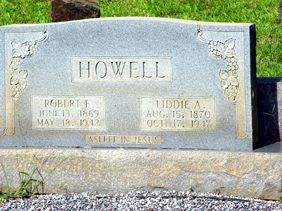 Her husband was the late Robert L. Howell. Survivors are three daughters, Mrs. W.E. Barger; Mrs. E.R. Abernathy, Mrs. W.P. Abernathy, several grandchildren and great grandchildren.